1) There is a page of flavor text introducing them. Split over 2 pages. And the players are expected to sit through them. Talk about OSR sacrilege. 2) The wizards aren't Rhialto the Marvellous and his buds. So the solution, as I see it, is to skip the scene altogether. Rather, the players are brought to the city by some random circumstances. In my own campaign, I had the city be the silver city on the moon hinted at by Raggi in The God that Crawls. And Scotty from #Shmelerak sent them there. There are a million portals that could be seeded. Ildefonse, the Preceptor of the council. 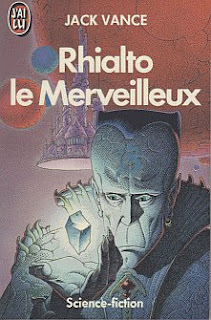 Rhialto the Marvellous. The apogee of wizardly fashion. Herark the Harbinger, precise and somewhat severe. Shrue, a secret diabolist*, whose witticisms mystify his associates, and sometimes disturb their sleep of nights. Gilgad, a small man with large gray eyes in a round gray face, always attired in rose-red garments. His hands are clammy, cold and damp; his touch is avoided by all. Vermoulian the Dream-walker, a person peculiarly tall and thin, with a stately stride. Mune the Mage, who speaks minimally and manages a household of four spouses. Zilifant, robust of body with long brown hair and a flowing beard. Darvilk the Miaanther, who, for inscrutable purposes, affects a black domino. Perdustin, a slight blond person without intimates, who enjoys secrecy and mystery, and refuses to reveal his place of abode. Ao of the Opals, saturnine, with a pointed black beard and a caustic manner. Eshmiel, who, with a delight almost childish in its purity, uses a bizarre semblance half-white and half-black. Barbanikos, who is short and squat with a great puff of white hair. Haze of Wheary Water, a hot-eyed wisp with green skin and orange willow-leaves for hair. Panderleou, a collector of rare and wonderful artifacts from all the accessible dimensions. Dulce-Lolo, whose semblance is that of a portly epicure. Teutch, who seldom speaks with his mouth but uses an unusual sleight to flick words from his finger-tips. As an Elder of the Hub, he has been allowed the control of his private infinity. Zahoulik-Khuntze, whose iron fingernails and toenails are engraved with curious signs. Nahourezzin, a savant of Old Romarth. Zanzel Melancthones. Those who meet him forget the details. Hache-Moncour, whose vanities and airs surpass even those of Rhialto. Hurtiancz, short and burly, notorious for his truculent disposition. *: As diabolism is verboten, Shrue is likely the secret villain of this module. †: Teutch will refuse to hold court with females in attendance. This is but one of the facets of the council's sexism. Females are much derided by the order as they think women to be seduction targets at best and dark practitioners of the art of ensqualming at worst. Let players hate the wizards; they can relish them being taken down in the future by that old threat from a previous aeon: The Murthe. Or maybe the PCs will actually help out on the conclave's darkest hour, because agency. More details about each wizard can be found here. Anyhoo, outside of the council court encounter, the players can look into rumors and such, finding out details of whatever wizards they want to target for burgling, the spell duel, or patronage. At some point, roll one of the wizards to be missing along with the Baton of Perpetual Light, opening the option to go to their tower or The Obelisk out in space.